Last Sunday, the Holy Father inaugurated the Year of the Eucharist, which will last from October 2004 until October 2005. This is a wonderful opportunity for us to rededicate ourselves to our belief that the Eucharist is in fact the body, blood, soul and divinity of Jesus - not a symbol, but really and substantially Christ Himself. 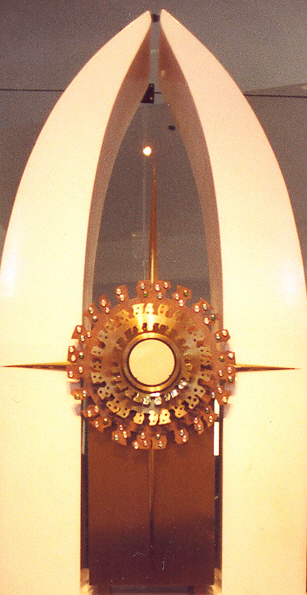 I invite you in this year of the Eucharist to spend time doing reading on the Eucharist; to attend daily Mass at least once a week outside of Sunday; to make pilgrimages to different holy places like the Basilica of the National Shrine or the Franciscan Monastery; and to make visits to the Blessed Sacrament. We are literally in the presence of God whenever we walk into a Catholic church. For me, it was a rededication to the Blessed Sacrament that led me to consider a vocation to the priesthood. I could think of no more important work in the world than to confect the Real Presence and nourish God's people with it. When we really engage the Eucharist, then everything in our life changes. It forces us to make a decision about who we are and who we are called to be. Sadly, many Catholics receive Communion each week not fully engaging the reality of what they are doing. This Year of the Eucharist gives us the opportunity to not let the mystery pass us by unnoticed. On this 29th Sunday of the year, we are invited to consider the importance of perseverance in prayer. We even see in the first reading how Moses, by keeping his arms extended, with the help of Aaron and Hur, helps the Israelites to defeat the Amelekites in battle. Moses' extension of his arms foreshadows how Christ would extend His arms on the Cross and win the battle of life over death. In our Gospel today, we hear about the parable of the judge who gives-in to the persistent woman's demands, not for fear of God but for fear that something bad may happen to him. His incentive is to avoid possible calamity. If the judge who has no fear of God listens to the woman, how much quicker is God to listen to the cries of his very children? He is not slow to answer. • Prayer is not so much a technique or method. Yes, formal and set prayers like the Mass and Rosary give our prayer doctrinal content and form and these are the center of the Church's prayer life, but what we're considering today is personal prayer. In personal prayer, we're not looking for a technique, as much as we should be trying to listen and rest in God. St. Teresa of Avila reminds us that prayer is when we look at the One who gazes upon us with love. • When we pray, we need to take time to be still and quiet and prepare our hears and minds to enter into conversation with God. Prayer itself is a grace and so we need to beg God for the grace to pray as we should. We can't expect to enter into prayer when we don't take time to detach from the world for a few moments and listen to God trying to speak to us. 1. First, persons give up on prayer, often because they don't perceive that their prayers are being answered. In fact, it may be the case that their prayers are answered but not always according to the way they like to see them answered. When people don't get what they want, when they want and how they want, then there's a strong tendency to give-up. It's as if God becomes a good-luck charm who has lost his power. So, we ask, "When I pray, do I think of God as having a real relationship with Him or do we think of Him as someone that we can appeal to for favors but only when we need favors?" Job so eloquently states, "We accept good things from the Lord, why do we not accept evil? Blessed be the name of the Lord." In other words, God knows what we need. Sometimes, He allows us to experience suffering so that we can draw closer to Him. Suffering is, after all, God's megaphone. St. Augustine exhorts us not to pray for what we need or want, since God knows that already. Rather, we should pray to accept whatever God wants to give us. 2. Second, persons give up on prayer because they don't know what to say. Again, prayer is not so much a technique or method as it is resting in God. St. Paul reminds us that we know not how to pray but it is the Spirit that prays within us. Prayer is a conversation that begins with God, not with our laundry list of needs. Take time to listen to God. Ask Him how His day has gone and how He wants you to see the world. So, if you don't know what to say, don't worry. Real prayer begins when you get caught up in the conversation going on between the persons of the Trinity. 3. Third, persons give up on prayer because they no longer feel the "warm fuzzies" or consolations in prayer. St. Teresa of Avila warns us that when we start praying, God gives us those warm fuzzies to entice us to come back to prayer, like candy. When we have reached greater spiritual maturity, he withdraws the feelings so that we approach God with pure hearts - not for what we can get but rather, for what we can give. The greatest saints all experienced arid prayer lives. Yet, they kept on praying because they wanted to adore and thank God and ask for His mercy. Christ's greatest prayer was performed at Calvary - that didn't feel good at all. 4. The final reason I would cite for a lack of perseverance is related to the attitude, "I don't have time to pray." That is a sign of a subpar relationship with God. That's like a parent telling their kid, or spouses telling each other, "I don't have time for you." We make time for the things that matter - TV shows, hobbies, vacations, work. How sad it is when God has to compete for our time. Finally, we consider how prayer is linked to faith. In our Gospel today, Jesus spends 7 verses speaking about prayer and than at the last moment, sneaks in this idea that prayer is related to faith for He asks, "When the Son of Man returns, will He find any faith on earth?" Here is what St. Augustine says, "In order to pray, let us believe; and for our faith not to weaken, let us pray. Faith causes prayer to grow and when prayer grows our faith is strengthened." My friends, if faith is necessary for salvation, then I would suggest that prayer is too. Let us ask the Blessed Virgin Mary to help us to pray as she did - in humility, purity, perseverance and in deep faith. She will assist all of us, her children, to draw closer to the merciful and compassionate heart of her son. Praise be Jesus Christ. Now and forever!